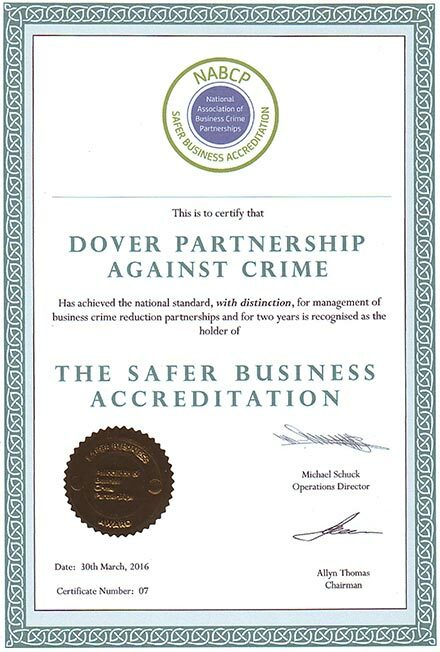 Set up 20 years ago, DPAC now covers Dover, Deal and Sandwich, and has more than 100 members, including retailers, licensees, transport firms and It is one of the most successful business crime partnerships in the country and has consistently been awarded a distinction at its two-yearly assessments. 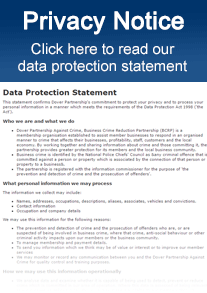 Click to view our Storage and Retention of Data policy and our Privacy Notice. Each DPAC member has a two-way radio which enables them to communicate with each other, the police and the CCTV control room. This system has proved to be a valuable resource in tracking criminals, deterring them from committing offences, and catching them if they do. PREVENT AND DETER AT ITS BEST! 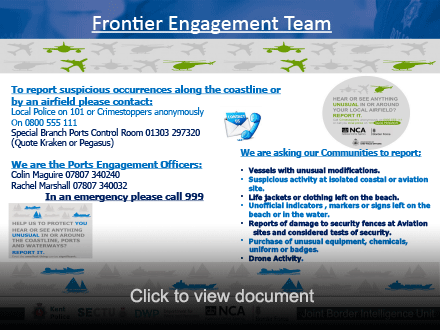 Dozens of thefts have been prevented by DPAC members in Dover, Deal and Sandwich through the Prevent and Deter strategy. Alerted by CCTV or other members, staff at stores have stopped shoplifters before they even get a chance to leave with the items which they intended to steal. One example of how this has worked was when Asda detained a shoplifter, took his details and banned him from their store. But they also noticed two bottles of alcohol (spirits) in his bag which had not come from their store. As a result, DPAC and CCTV followed him and saw that he met up with another man around the back of the health centre off Maison Dieu Road. They went to Pencester Road and Pencester Gardens. We warned Poundland and Marks and Spencer. The chap who had been detained at Asda went into M&S and picked up several items. But the staff were all around him, followed him everywhere, and he eventually put the items back. In the meantime the other man had gone into M&S and was also followed and watched by staff. He was looking all around him to see where the staff were. He picked up several items and put them all back before leaving. The first man bought some rolls but as he walked back towards the door he picked up a chicken - once again the staff were near him, and he put it back. The men then went into the Co-op where staff, who had already been alerted by DPAC, were waiting at the door. The man was greeted with a cheery "good morning, how we can help you" and was followed everywhere around the store, and constantly being told he was being watched. He left empty handed. The men then walked back up through the town - out of CCTV coverage - but were followed to the Priory Station where station staff asked them where they were intending to travel to. They said Folkestone, and were going to buy a ticket on the train. They were told they had to buy a ticket first, so they walked out of the station.